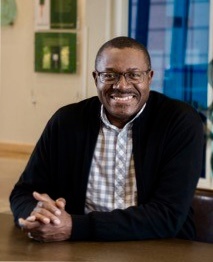 CHICAGO (March 22, 2019)—When Paul Robinson envisions justice work, he sees opportunities to engage everywhere—cities, suburbs and rural areas—and in partnership with everyone—local churches, schools, governments, nonprofit organizations, and businesses. This is the philosophy he carries with him as the Evangelical Covenant Church’s nominee for the Executive Minister of Love Mercy and Do Justice (LMDJ). Robinson will sit for election June 27-29 at Gather 2019, during the denomination’s Annual Meeting, which is comprised of delegates from Covenant churches across North America and represents the highest governing body of the Evangelical Covenant Church, or ECC. Raised in Chicago, Robinson now lives in Minnesota with his wife, Kim. They have seven children, the youngest of whom is a high school junior at Minnehaha Academy, a private Christian school that’s a ministry of ECC’s Northwest Conference. Robinson earned a bachelor’s degree in finance from Eastern Illinois University and a Master of Divinity from McCormick Theological Seminary in Chicago. Robinson, a bi-vocational pastor, also works as a senior community leadership consultant with the Amherst H. Wilder Foundation of St. Paul, Minn., where he creates, designs, convenes, and facilitates workshops for nonprofit, for-profit, and government organizations. He also serves as a leadership consultant and is the former director of Wilder’s James P. Shannon Leadership Institute. Robinson says he is in awe of the enormity of the role as well as the work of the executive ministers of LMDJ he’d be succeeding, Cecilia Williams and Debbie Blue. He also sees how his life has aligned to take on the position, from his work in anti-racism to intercultural development to nonprofit work to pastoring.